One of the really interesting things about touring around New Zealand is the fact that you come across all sorts of cool things to do and see tucked away in out-of-the way places. While on a drive through the countryside to the south of Auckland we came across an amazing vintage railway society at Glenbrook (about 9 kilometres from Waiuku), where you hop aboard lovingly restored rolling stock for a journey into yesteryear. Volunteers dressed in 1890s' costumes man the rebuilt station and buildings, or dealing out cups of tea and snacks, while others prepare a grand collection of engines and carriages for your 12-kilometre journey. You have a marvelous choice of places to sit - from luxurious leather seating, to carriages with pressed metal ceilings and antique lamps. If you want more adventure and to get the real smells and sounds of steam engines then hop aboard an open car positioned right behind the engine. You get the delightful smell of burning coal, followed by cinders and soot - but it should be mentioned that it's best to avoid wearing light-coloured clothing. The thing that amazed us was the sound of the steam whooshing out of the mechanics - it really is loud and comes out at high velocity. The No.1 engine we were on - a former New Zealand Railways unit Ww480 - had us going along the rails at a very creditable 30 kilometres per hour. 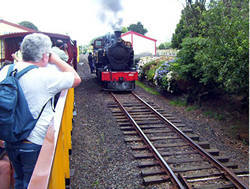 The railway travels all the way in to Waiuku nowadays, with a 15-minute stopover at the workshops that used to be the finishing point for the journey. At the workshops engines and rolling stock are restored to operational status and you can also watch as the fireman refills the coal load, or water levels are topped up. It is intended that the railway line will eventually extend from the current interim terminus at Victoria Avenue, Waiuku to the Tamakae reserve on the shores of the Manukau Harbour. If you are really lucky you may get an opportunity to take the ride in the engine cab and see how the driver and firemen have to work the vintage set-up. It is slightly cramped - and can get pretty hot - and you do need to be mindful there is an open door at your side - but what an adventure! Adam, the fireman, scooped shovels full of South Island coal into the furnace at very regular intervals and made sure the steam pressure never rose above 180 pounds per square inch (psi). 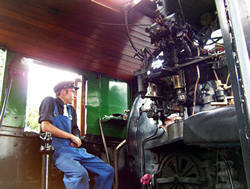 Our driver, Robert, who's also the society's accountant, easily worked the levers and brakes and moved the heavy machine as if it was a Mini Cooper - we barely felt it as the engine recoupled with the carriages for the return journey. The Glenbrook Vintage Railway was built in 1970 - construction began only three years after the Waiuku line was closed by the Government - and has been operating since 1977. Now if you've got youngsters or grandchildren who are into Thomas the Tank Engine and friends then the Glenbrook Vintage Railway does put on special Thomas days. Now that has got to be heaven for them! And if you really want to go back in time then there are jigger rides available. You have a choice between motorised ones that go for 4km, or hand-operated ones around the station. Operating Schedule: The regular operating season starts on New Zealand Labour Weekend (late October) and continues until Queen's Birthday (early June). During this season trains operate Sundays and most public holiday weekends. Trains run on the hour from 11.00a.m. to 4.00p.m. Group discounts available for parties with 15 or more fare-paying passengers when paying in one lump sum. NOTE: Increased fares may apply to special event days such as the Day Out With Thomas Event. 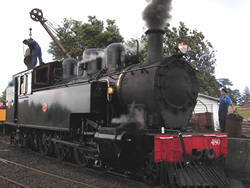 For more check out www.railfan.org.nz.